Captain Dave Carraro has an invaluable 38 years’ experience fishing the East Coast, Bahamas and Mexico. His specialty is Tuna and Cod fishing which is what he spends most of his time doing. One of his most recent year’s best was 2016 with 88 giant tuna landed. To date he has 9 giants over 1,000 pounds and many other years just as close. The largest bluefin was 11 feet and just over 1,200 pounds!! Nothing can surpass a proven track record and year after year he continues to put his customers on the fish. Most boats don’t even catch but a few giants in a lifetime. Not every day of fishing always yields a spectacular catch with some days better than others, but Dave will guarantee you he will give you his best effort to catch as many fish as you possibly can, even if it means staying out longer or traveling further. He is 100% dedicated to giving you a great day! Dave holds a U.S.C.G. 100 Ton Masters License (#1039410). Dave is also an airline/instructor pilot and currently a Captain at Jetblue Airways, flying over 25 years. He’s checked out as a Captain in several different types of jets, from commercial airliners to corporate jets. As an airline pilot it’s all about safety and professionalism and Dave has incorporated that into a clean, organized and professional fishing operation. Dave is regularly featured in the media such as recent appearances on Fox News and CNN. 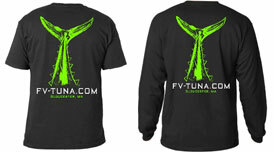 For FV-TUNA.COM merchandise visit our store at www.fishgloucestergear.com for tee’s, hats, hoodies and more. Captain Sandro Maniaci has spent years honing his fishing skills. From fishing on local ponds as a kid too fighting giant tunas his fascination, passion, focus, determination and never give up attitude, has led to his success on the ocean. Sandro has been a crew member of the F/V Tuna.com for eleven years and Sandro attributes much of his success to fishing with Captain Dave Carraro. Sandro considers Captain Dave to be one of the best tuna fishermen on the east coast. Each time they are out at sea, Sandro learns something new from Captain Dave to improve his craft. In order to continue to challenge himself, Sandro has obtained his Master Captain’s license. Over his short eight years fishing for Tuna, he has caught numerous 1,000 pound tuna. In fact, the first tuna he caught was over 1,000 pounds. He has had many battles with tuna lasting several hours. Not only an avid tuna fisherman Sandro loves deep sea fishing on the bottom for cod and haddock or sitting inshore and catching big striped bass and bluefish. You can always find him out on the water chasing the next big bite. For Sandro merchandise visit his store at http://bigtunaapparel.com/ and check out his Wicked Tuna T-shirts, hats, hoodies and more. Capt. Geordie Sousa has always had a passion for being on the water. Growing up catching Striped Bass in the Ipswich and Merrimack Rivers, he always had a drive to catch bigger fish. After catching his first tuna in 2007, Geordie was hooked and has been fishing hard ever since. Geordie is always trying to learn more and striving to be a better fisherman. While chasing giants is his passion, Geordie also enjoys catching Striped Bass and ground fish. Geordie has fished many locations all over the world from New England to Bermuda to the Bahamas. Geordie began fishing with Dave and Sandro on the Tuna.Com in 2009, and earned his captains license in 2011. After finishing college in 2012 he made the decision to continue fishing full time and continues to learn more and more every year. Geordie spends his winters coaching ski racing in New Hampshire. Our marine engineer Pickles, completed his American Boat & Yacht Council’s Marine Technician Certification Program (ABYC) from Marine Mechanics Institute in 2010. With a passion for licking salt off of giant tuna and even haddock, Pickles is on almost every fishing charter we do. With a patent pending on a device to turn sea water mixed with filtered cod poop into viable diesel fuel, Pickles has reinvigorated the green energy movement among offshore tuna fisherman. Also known for smelling 73 inch or bigger tuna from long distances, he gets us on the fish when even our state of the art fish finders fail. In his free time, he is quite the ladies’ man, with a long line of fans waiting for him to sign Wicked Tuna T-Shirts when we reach the dock. Bring warm clothes even if it is forecast to be warm. Bring food and beverage (no hard liquor). Bring coolers, but leave in your vehicle.We have plenty of storage. Be well rested for a great day of fishing! Check out our archived fishing reports and the new ones on our blog.